For the practicing clinician, the dilemma becomes how most appropriate to sequence the aforementioned regimens. 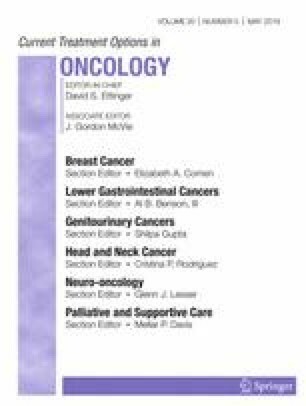 It is challenging to be dogmatic, as there are no comparative studies juxtaposing novel front-line options directly—all of the available studies utilize a comparator arm of sunitinib. With this in mind, the selection of front-line therapy with a patient with mRCC should involve a thorough discussion of both efficacy and safety of available options. The oncologist must also weigh their ability to manage complex immune-related adverse events that can emerge from checkpoint inhibitors, particularly with dual regimens such as nivolumab/ipilimumab. For the patient with good-risk disease, VEGF-directed therapies should remain a component of treatment. The data from CheckMate-214 does not support the use of nivolumab/ipilimumab in this setting, and in fact suggests superiority with the approach of VEGF-TKIs. Until regulatory decisions have been made around bevacizumab/atezolizumab and axitinib/avelumab, sunitinib and pazopanib remain options for patients with good-risk disease, although cabozantinib should be a consideration as well. Although the CABOSUN study did not include patients with good-risk disease, it is important to bear in mind that this was more of a pragmatic decision—inclusion of these patients in the original design could have potentially lengthened the extent of necessary follow-up. From a mechanistic standpoint, there is no reason to assume that cabozantinib would not also achieve superiority to sunitinib in patients with good-risk disease. For patients with intermediate- and poor-risk disease, cabozantinib and nivolumab/ipilimumab represent the only reasonable options thus far that have achieved regulatory approval. As previously noted, nivolumab/ipilimumab has proven benefit in this setting, but should be used only by the oncologist who has ready access to subspecialists who can aid in managing immune-related adverse events. Prompt recognition of colitis, hepatitis, and other sequelae from these therapies is critical, as these toxicities can be life-threatening. If such resources are not available, then cabozantinib should be considered. Cabozantinib should further be contemplated in the subset of patients with bony metastatic disease, where it appears to offer substantial control. Of course, it also represents an option for those individuals who have contraindications to immunotherapy, such as rheumatologic and autoimmune disorders. When combinations of VEGF-directed and immunotherapies are approved, the clinician will have an even more complicated dilemma. Regimens such as a bevacizumab/atezolizumab offer an exceptional safety profile, which may weigh heavily in frail patients who cannot tolerate the side effect profile associated with VEGF-TKIs. Nicholas J. Salgia declares that he has no conflict of interest. Yash Dara declares that he has no conflict of interest. Paulo Bergerot declares that he has no conflict of interest. Meghan Salgia declares that she has no conflict of interest. Sumanta K. Pal has received compensation from Genentech, Aveo, Eisai, Roche, Pfizer, Novartis, Exelixis, Ipsen, Bristol-Myers Squibb, and Astellas for service as a consultant. Press Release: Merck’s KEYTRUDA® (pembrolizumab) in combination with Pfizer’s Inlyta® (axitinib) significantly improved overall survival (OS) and progression-free survival (PFS) as first-line therapy for advanced or metastatic renal cell carcinoma (Available at: https://investors.merck.com/news/press-release-details/2018/Mercks-KEYTRUDA-pembrolizumab-in-Combination-with-Pfizers-Inlyta-axitinib-Significantly-Improved-Overall-Survival-OS-and-Progression-free-Survival-PFS-as-First-Line-Therapy-for-Advanced-or-Metastatic-Renal-Cell-Carcinoma/default.aspx; last accessed 21 Dec 2018.